Alessandro Vitti and J. Calafiore split the artistic duties on this issue, though it is difficult to tell without looking up which artists penciled which pages. Charles Soule continues to impress with his writing as he brings Ice back into Guy Gardner’s life. In issue 27, the Red Lanterns split up, which seems to be how these characters work best. Rankkor and Bleez have become something of a cross between an it couple and a buddy cop duo. We see the two return to form as they search for Ratchet’s ring. Although it has been teased since he lost his ring, Atrocitus finally returns to his true form, and he doesn’t seem very happy. Skallox and Zilius Zox tend to be the comedic relief more often than not, keeping Red Lanterns light. Taking the two on a tour of Earth was a nice touch, now that the reds are in charge of sector 2814. The real depth of this issue comes from the interactions between Guy Gardner and Ice. He returns to Earth in order to come clean to her, informing her (and the reader) the real reason he became a red lantern was to prove that he can indeed control his rage. Not willing to take him back immediately, Ice agrees to follow Gardner along, as he attempts to prove to her that he can indeed make things work. Ice’s hesitation might catch the reader off guard, as Guy has a new look that makes one wonder how he doesn’t get any woman he wants. There really isn’t much to gripe about with this issue. 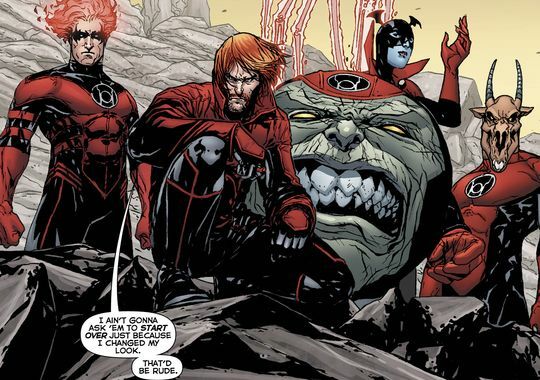 The characters work best when split into small groups, which we see once again, and Atrocitus is officially back. The biggest complaint I can find is the inclusion of Shadow Thief. When Gardner instructs Skallox and Zox to behave themselves and avoid Earth’s more powerful inhabitants, the reader’s mind goes to ideas of them running into someone a bit more A list. While Shadow Thief is an interesting match, given her powers, as well as her hatred of aliens, I couldn’t help but feel a bit let down. This issue is just plain fun. There’s a little bit of action, romance, humor, and character development, and none of it seems out of place. Charles Soule is quickly making his way up the ladder, becoming one of the best writers DC has on staff.